Entryway Flush (or Semi-Flush) Mount Lighting – Help Me Choose, OK? When we started our renovation process, it was 100% about getting a new kitchen, and I knew pretty much exactly what I wanted my new kitchen to look like. I actually met this designer at the Oak Park River Forest Kitchen walk, and I acted like a star-struck jackass because I am obsessed with everything she does. And she’s local-ish! And I can’t afford her! So, inspiration it is. Our house is a bungalow, built in the 1920s, arguably arts and crafts style, but it’s unlike any bungalow I’ve ever seen in the Chicagoland area. Previous owners (we’re the fourth in the last 15-20 years) did a major renovation that included an arts and crafts-style fireplace and mantle, so it’s not original but it fits the house quite well. The tile they used is green and yellow with some muted reds, so the green tile really spoke to me for the kitchen. So, we’re doing it, probably crackle, if it doesn’t blow my budget. But we’re here to talk about flush mount and semi-flush mount entryway lighting. So when we decided to redo our kitchen, we had to move stairs, which pretty much means the entire house is changing. We decided to relocate our stairs to the front of the house, in the living room. HEAR ME OUT. One of the (only) benefits of moving into the this house and living in it for several months before I said, “I’m calling an architect,” was that I realized a few things that really, really bugged me–specifically, not having an entryway. Our front door opened open directly into our living room, and not like, off to one side or anything, right smack in the middle. IT DROVE ME INSANE. With no informal space for a family room, the room always felt like it was trying to do too many things while also being split in half which created a weird flow and a lack of obvious spots to drop our crap when we walked in the door. 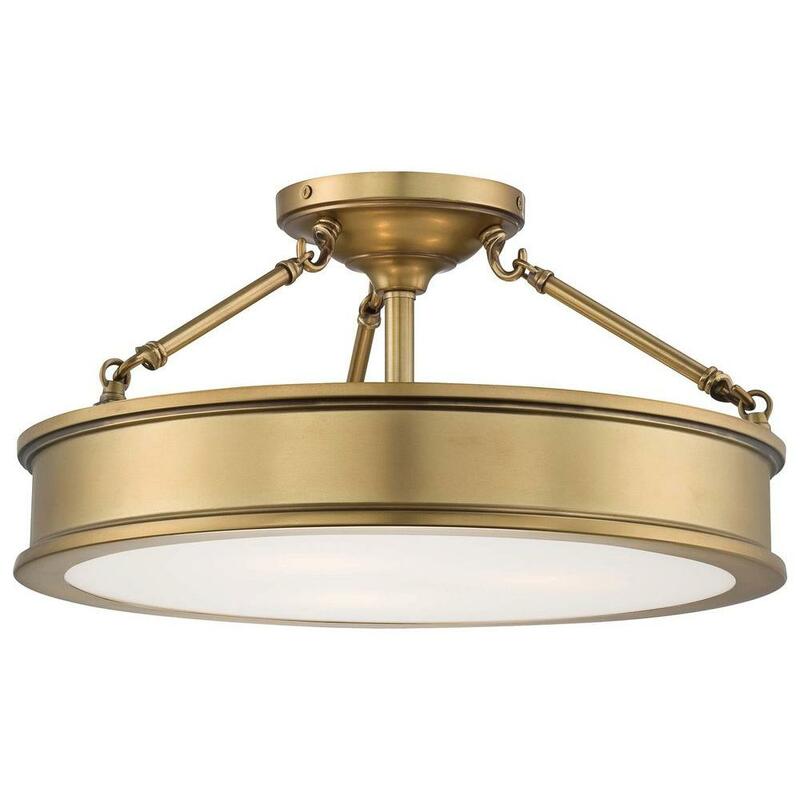 The fixture must be flush or semi-flush mount because the ceilings are only about 8’7″. We need at least 2-3 bulbs, ideally at least 60 watts each. This room gets approximately zero light (and we’re losing a window) due the huge front porch. I don’t mind completely mind it in this room, especially now that we’ll have a real family room in the back of the house. I’m ok leaning into the moodiness of this room, which will eventually have a small sitting area around the fireplace. I am style-neutral. Sort-of. I don’t feel I have to stick with the mission-type fixtures the previous owner had, and I don’t plan to. It’s really not my jam. I want something that will make me smile when I walk down the stairs everyday. I’m leaning toward the middle option. The Pottery Barn one is a little on the pricey side, and has more of a Victorian feel that doesn’t quite fit the house. The bottom fixture feels a little bottom-heavy or something? So maybe the middle is just right. No Gifts Please: Should Your Child Have a Gift-free Birthday? When I wrote about Emme’s 3rd birthday and showed off the adorable invitation, you might have noticed that “No Gifts Please” was printed under the date and location information. Yep… We asked people to skip the gifts for our kid’s birthday. Maybe that seems horribly mean? Here was my reasoning: My daughter is the only grandchild on one side of the family; one of three on the other side. I knew her grandparents and other close relatives would give her generous gifts, and from that alone, she would be receiving quite a bit of stuff for her birthday. When the guest list for her party started to get a little out of control, I started to think about the added clutter and writing dozens of thank you notes. Based on my untrained medical opinion, my blood pressure began to rise. So I started to think about requesting no gifts. As you can imagine, the first person I consulted for advice was the entire Internet. And like most things on the Internet, the people seemed divided. Some regarded a parent’s request for no birthday gifts as an affront — they seemed convinced it was a trick. Others were totally on board. Since the Internet is typically not to be trusted, I asked my IRL mom friends for feedback. Everyone seemed to think it was totally fine. They reassured me that no one would be offended by a “no gifts” request. They also said that people would probably bring gifts anyway (they were right). I went for it. And many people brought gifts. That’s OK. Some people didn’t. That’s OK too. The people who did bring gifts, brought smaller items. Some people skipped the gift, but brought Emme a small token — a mylar balloon or pack of stickers. Others took the time to write a sweet message in a birthday card. And it was all good! We did get less stuff, which was the main goal. However, the decision to ask for no gifts did have some pitfalls. People weren’t totally sure if we really meant it (we did), and a good portion of the party goers apologized for either bringing a gift or not bringing a gift. It was definitely not my intention to put any kind of pressure on my friends and family. I thought about trying to get super cutesy with the request that guests not bring gifts (“Your presence is our present,” etc. ), but ultimately clarity and simplicity won out. Make sure you mean it, but don’t be crazy about it. Some people will end up bringing gifts and some won’t. If the choice people make is going to bother you — either way — just don’t do it. People will likely ask you if you’re sure about this “no gifts” thing. A friend asked me, and I almost launched into a whole, you don’t have to bring a gift, but you know, people might bring small stuff and you should do what you want. You know what that sounds like? That sounds like I expected small gifts, which are still gifts. And I didn’t. So I just said that I meant the request and not to worry about bringing a gift. Keep any gifts out of sight. Often at parties, the gift table is displayed front and center. But if you’re asking people not to bring gifts, displaying the gifts can make people feel uncomfortable if they didn’t bring one. We tucked gifts away under a picnic table, and I don’t think anyone gave it a second thought after they arrived. Don’t open gifts at the party. To be honest, I haven’t been to a kid’s party where gifts have been opened in front of guests since Emme was born. When you’re entertaining families with young children, making them sit through an extensive gift opening session can be tedious. But if you do typically open gifts at a party, don’t if you’ve asked for no gifts. That will make people think you weren’t serious about your request and make them feel bad if they followed your instructions. Emme had plenty to open, and at 3, she wasn’t totally obsessed with the idea of getting tons and tons of gifts — though I imagine that was the last time this will be the case. I probably won’t do it again, but we’ll also probably be transitioning to parties that are more kid-focused that family and friends focused.